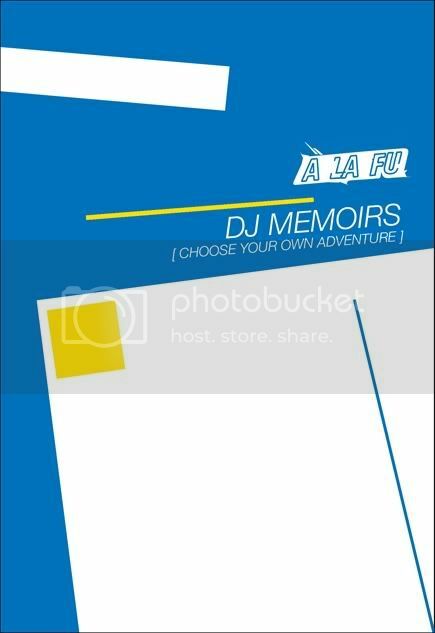 DJ Memoirs is a double CD and book release from the amazing A La Fu. Conceived as A La Fu’s final blow out / I may as well go out with a bang moment after an increasingly frustrated relationship in the world of dj’ing over the piece this project reflects lives and times through that curious pastime of playing records. An insight into the weird and wonderful world of the disc jock, it’s scenarios, twists and turns and depending on what kind of person you are it’s bitter sweet taste. Based on the role-playing stories we may have read when we were kids, this undertaking is essentially a mix tape that runs in conjunction with a number of short narratives all of which relate to music selection and various settings you may find yourself in when playing records in public, whether touring, in clubs, bars, festivals with even a wedding party thrown into the mix as you never know what you’ll be asked to do. As a double CD and book release, the DJ Memoirs project works by having a Main Mix on Audio CD which is spliced at certain points and it’s here where you will have the choice to insert the various sections of audio you will find on the second CD into your media player seamlessly depending on whatever style, environment or situation you’re in the mood for, essentially having the ability to create many different setlists, rearranging where you see fit, with or without the story…hell, make up your own. There’s even a wee map to show us some examples. With over 8 hours of music this not only illustrates A La Fu’s approach to music and record playing or is an insight into the various directions a night can go but also reflects and comments on how the modern world buys, compiles and listens to music today by creating each and every one of our own individual playlists. We’re all disc jockeys at heart but you can tell a lot about someone when they play a record. Oh yeah… and I did the artwork!